How does a person disinterested in physical activity get interested enough to participate in regular exercise? You may have heard it said that the most successful exercise program is the one you that you’ll actually do. There may be more truth to that statement than one realizes, as exercise is essentially a very personal experience. While, some suggest taking online “exercise personality quizzes,” or “matching exercise to body type,” the truth is exercise that doesn’t have to be perfectly matched. However, to form a lifelong habit, it does need to be personally meaningful. For many, motivation requires more than the knowledge that regular exercise results in health benefits somewhere in the distant future. If you think of exercise as an externally imposed chore rather than a time of release, perhaps a change of attitude is exactly what’s needed. Take it slow. Deciding to start exercising is the first step toward better heath. Be realistic about your fitness level, as an injury is the surest way to curtail any exercise plan. As new habits are difficult to form, focus on establishing an easy routine that you can stick to. Initially, it’s more important not to miss workouts than to fret about progress. Once you establish a habit, you can concentrate on improvement. Change your mindset. Similar to the way grade school students look forward to recess, think in terms of exercising as enjoyment, as opposed to drudgery. Sometimes it’s the challenge of just showing up and getting started, not the workout itself, that’s hardest to overcome. Just do something. Physical activity of any kind for any amount of time is better than no movement at all. While, it may not meet the currently recommended 150 minutes per week of moderate activity, choosing to create opportunities for movement throughout the day is a strategy that might take you from a sedentary lifestyle to a more active one. Set goals. Not weight loss goals, but actual fitness goals. Some find that initially setting personal goals that are slightly challenging, but not overwhelming, helps to prevent them from giving up, and keeps them motivated to exercise another day. Keeping a record of improved strength, endurance, flexibility, and your commitment to better health is highly rewarding. Take the initiative. Make it easier to get out the door and into the gym. If you’re off to work in the morning, pack your workout bag the night before, and leave it by the door to pick up on your way out. Better yet, put it directly in your car, not in the trunk, but in your line of vision, as an incentive to swing by the gym on your way home. If the day is yours to do whatever you like, start the day dressed in your workout clothes to increase the chances that you’ll do something physical. Embarrassed to go to the gym? Comparing yourself to others can be intimidating. Remember, everyone starts somewhere, and just showing up can improve your self-esteem. Maybe you prefer the great outdoors, but if you do want to use gym equipment, lift weights or take classes, check out several clubs before you join one. Focus on your own personal goals for improved wellness, and start thinking of yourself as an athlete, not a couch potato. You’re never too old to have fun. If you loved riding your bike as a kid, try it again to see if it still feels like freedom to you. If you’ve always admired the beauty, grace and svelte physiques of ballet dancers, take a beginner’s class or try hip hop at the gym. If you loved summertime and playing in the pool at every opportunity, get back in the swim or take a water aerobics class. If you love watching martial arts movies, there are many unique self-defense or self-transformation classes to try, all of which provide mental therapy as well as physical activity. Use exercise for stress relief. After a particularly stressful or frustrating day, a yoga class, time in the gym, basketball with the kids, or a brisk walk with the dog before dinner can help to release negative emotions, clear the mind, and support restful sleep. Stay accountable by building a support network. 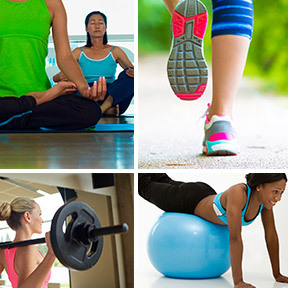 Planned workouts with a friend or a group help keep one accountable. It’s easy to hit the snooze button on cold winter mornings when you’re not accountable to anyone else. You’re much more likely to get up and go when you know your friend or group will be waiting for you. Get creative. Varying your routine helps keep things interesting. You don’t have to do the same workout every day. To make your workout more appealing, change up your routine. Take a different walking route, or listen to thought provoking podcasts. Before you realize it, time’s up! Build you fitness plan around activities you enjoy. Regardless of what type of daily exercise you choose to do, incorporate some aerobic activity and strength training, as well as some flexibility, balance, and relaxation exercises weekly. Stick with it long enough to create a habit and you’ll gain the invigorating advantage of increased energy, improved mental wellness and better physical fitness.